Vietnamese culture was permeated by their Confucian philosophical beliefs. This philosophy based for the existence of and extended familystructure through 2,000 years ofVietnamese history (Lam). It was believed that: …”in order to achieve human perfection, one must follow the established codes of behavior of Confucianism which include reverence for ancestors and respect for elders…The importance is not upon the individual’s accomplishments but upon his duty to family and society” (Muzny). 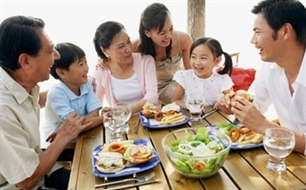 The Vietnamese household traditionally followed the extended multi-generational pattern. The parents, their sons and their wives, their children, and unmarried siblings usually constituted a Vietnamese household. In this structure, frequent contacts were maintained, and this constant closeness to family was emphasized from childhood and continued to be important to Vietnamese throughout their lifetime (Lynell). “Most Vietnamese placed more emphasis on their roles, privileges and obligations within this group than on their own individual desires”(Muzny). In this extended family, the most important expectation was respect for the elders. The family decisions were made by the parents and grandparents. The traditional Vietnamese worshipped ancestors as a source of their lives, fortunes, and civilization. The spirits were honored on various holidays and the anniversary of their death (Tran). For centuries in Vietnam, traditional family values were accomplished by the fulfillment of traditional roles: the role of man and woman as parents. Vietnamese valued their traditional ideal of male superiority. Since the highest status in Vietnamese families is given to the man (father), he had absolute authority in the household. His position as provider for the family was unchallenged. Because he provided the main source of income for the household, he was never expected to work in the kitchen or to cook. After work he returned home and relaxed. As a head of household he had the final decision in all matters, although he might consult his wife or children. In her report, Phung cited that the father, however, had the duty to exercise restraint and wisdom in running his family in order to deserve his respected position. Having a boy in family was a “must” because the eldest son would assume the duties of his father when he died. A family which had no son to continue the process was superstitiously thought to have disappeared forever. In a patriarchal society, Vietnamese woman had limited rights and took a secondary place in family. Women were brought up according to a strict discipline, and have been traditionally less educated than men. They usually do not enter the job market outside the home. “Girls from birth were at a disadvantage”. Daughter is not considered necessary in heritage. According to Lam, Vietnamese traditional viewpoint was “If you have a son, you can say you have a descendent. But you cannot say so even if you have ten daughters”.After marriage, woman became housewife and mother. She was expected to be dependent upon her husband, budgeted his income for the household, took care of children and even grandchildren, performed all household tasks. According to Muzny, divorce was legal but not common. A wife can be unhappy in her marriage; but rather than accepts divorce, the family encouraged her to sacrifice and to endure the difficulties of the marriage for the sake of her children. Parental role in family was to define the law. Obedience and respect were the traditional virtues which Vietnamese children were taught to exhibit in the family. Discipline and physical punishment were acceptable remedies for disobedience in the Vietnamesetradition. “Harsh discipline and beatings did not constitute abuse of a child, but itsreverse: loving care, concern and attention” (Breeman). When parents grew old, children were expected to take care of them to compensate for the gift of birth and upbringing. The elderly (parents) were supported by married or unmarried children until they die (John). “Boys and girls are not free to do what they want. Girls are under strict supervision” (John). Western style courtship and romance were seen as inappropriate for unmarried children. “Virginity is cherished. Pregnancy out of wedlock is uncommon, and it is a grave disgrace to the family” (Muzny). For their children’s marriage, parents generally made decision because they could judge better. Vietnamese parents had a high regard for education. It was considered a way for family advancement. Parents encouraged their children to study and excel in their education. Vietnamese placed a higher value on education rather than on material success. In brief, “Depending upon the family for financial support, requesting permissions for expenditures, and having parents make decisions for them characterized the traditional Vietnamese child” .